Monday went zooming by -- I never even thought about posting my normal Monday post. We are down at the beach house with friends from college. Bob and Pat rowed for University of Southern California together. When Bob married Barb it turned out that we all became great friends. We go for too many years without seeing each other but we pick up our friendship without missing a beat. Here we are after finishing a great meal at Blue Moon Brewery in Manteo, NC. We had spent the morning at the Fort Raleigh National Park on Roanoke Island. This was the site of the first European settlement in America. If you remember Walter Raleigh and Queen Elizabeth I, and the Lost Colony form American history, Fort Raleigh is where it took place. Walter Raleigh organized the trip from England with the approval of Elizabeth I, the Virgin queen. Raleigh was hoping to start a settlement of English and gather resources and wealth from the land. That's not what happened. The governor of the land went back to England and couldn't get back to Roanoke Island for 3 years. All English ships were being used to fight the Spanish Armada. Not good for the settlers. They were gone when Governor White was able to return. It's still a mystery of what happened to them, including the White's granddaughter who was the first European child born in the New World. Bob and Barb go back to California tomorrow and we're headed home. I leave the next day for Sharon's in MD and then on to retreat on Friday. I have a little bit more cutting to do for the two main projects I'm bringing with me to work on. And, of course, I need to clear out the suitcase and refill it with clean clothes. I'll probably have less than 20 hour turn around. Here's Dorothy's quilt that I finished quilting last week. She was happy to pick it up last Friday. The fabrics were so busy you really couldn't see the quilting, even close up. It is a beautiful quilt -- I always like blue and yellow quilts. Here are my goals from last week. Most got done. Sew like a fiend and get whatever I can done! Today I'm linking up with Monday Makings, Main Crush Monday, Freemotion by the River. Grab a cup of joe and surf the internet a bit to see what's happening with quilty blogs! You look like a very happy crew. 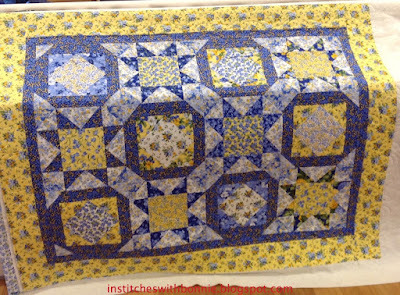 Dorothy's quilt is gorgeous, it's hard to resist blue and yellow. Enjoy all your traveling this week. Spiral staircases are not a favorite of mine, so I, too, would admire the lighthouses from the ground. Love the blue and yellow quilt - someday I'll make one. I know your friend loved the quilting you added. Have another fun week of friends, family, and fabric! 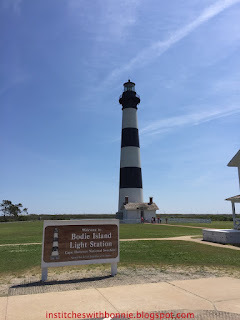 Lighthouses are some of my favorite places to visit on vacation. (I'm in Michigan where there's no shortage of them.) But I'm with you. I much prefer to view them from the outside than climbing the stairs--not because of claustrophobia, but problems with heights! The blue and white quilt is very pretty, but what bowled me over when I came to your site was the picture of the quilt on the fence under the flowering tree. Lovely!! 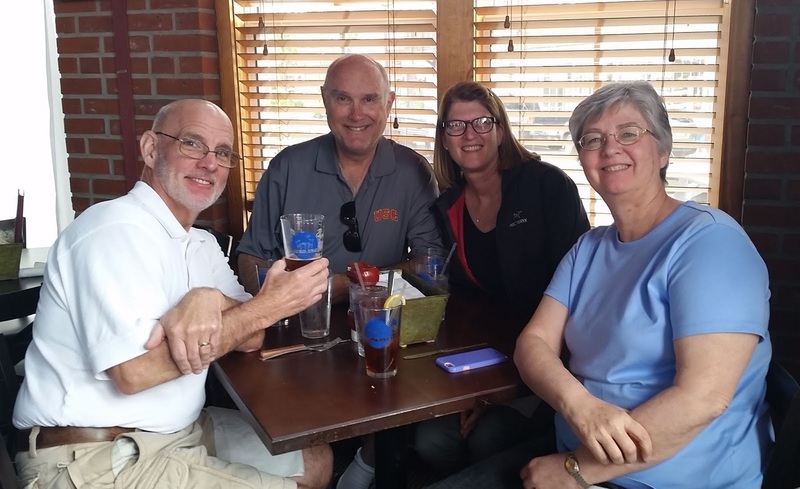 It's always great to visit with long-time friends. 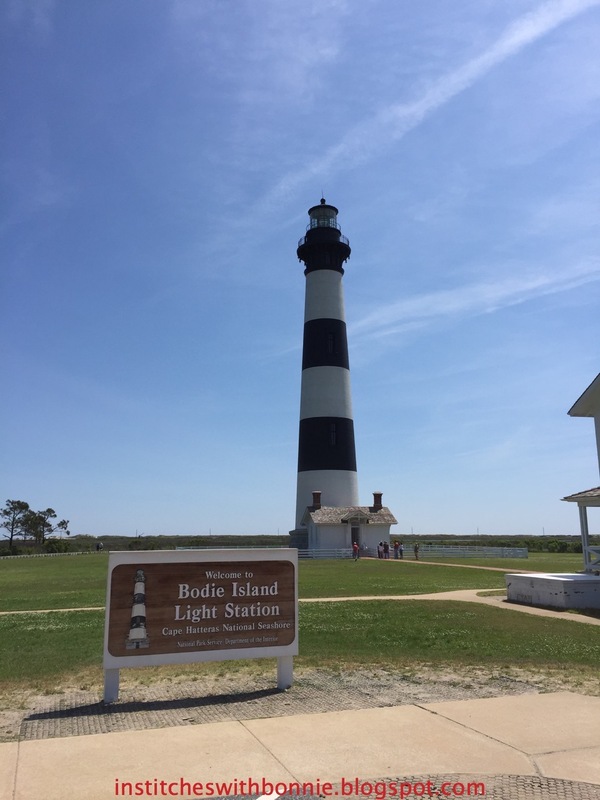 We have a modest list of lighthouses-we-have-visited. I try to climb to the top, but Stevens isn't able to do that any longer. The highest one (so far) has been Cape May.